A group of teenagers, who have been accused of breaking into a Glasgow hospital, filmed themselves screaming in horror as they uncovered what they thought to be a dead baby in a bag. 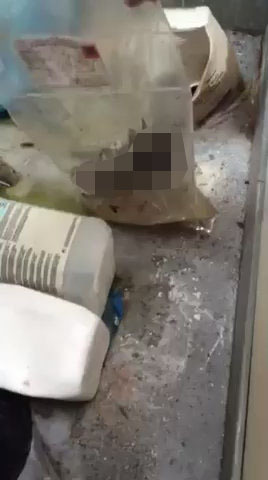 Two 13-year-olds and two 14-year-olds broke into the hospital and filmed themselves wandering around the disused unit where they found the ‘dead baby’ in a plastic bag. The youths then pick up the bag, with what looks like an infant with its umbilical cord still attached inside, and toy with it before the video ends. However, experts have claimed that the baby is in fact a realistic doll used by trainee doctors and nurses for learning purposes. One of the children’s parents found the video in a Facebook group chat and notified the police. Me and my wife noticed the video in a group chat on Monday morning. We check up on his Facebook regularly because he’s only 13. The whole building at Stobhill has been broken into for several weeks by curious kids during the summer holidays with nothing to do. My boy seems quite traumatised. Whatever the reality is, it makes for an incredibly harrowing video.